While widely know for being an academic powerhouse, Exeter is perhaps not as familiar to people for its athletic excellence. Families who come from large suburban school systems bursting with school spirit and championship banners, soccer moms and dads who spend just as much time coaching as they do on the sidelines, families who are intimately familiar with early morning ice times and pool smells and weekend tournaments, students who kill in on the tennis court or the basketball court or the cross-country course—kids who wear out athletic shoes before growing out of them—these are the kinds of families who might not think about Exeter as offering an athletic program to match what they might find at home. But it does. 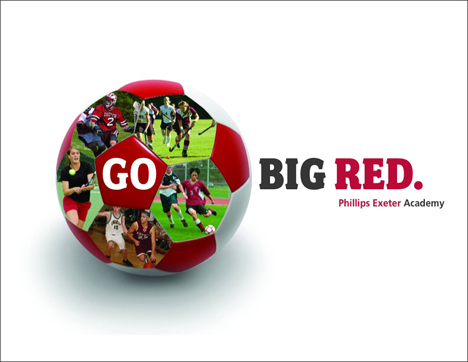 In this brochure we show the breadth and depth of Big Red sports—the spirit, the quality, the resources and the meaning of athletics in an Exeter education.